The countdown to Christmas is on! I am pretty much done. Phew. One cool shopping experience I had this year was looking for a gift for my Secret Santa. As part of a festive campaign with jcpenney and Mom Central, I chose a gift from jcpenney for a fellow blogger, and someone has done the same for me. Browsing jcp.com, knowing only a few things that she likes was a challenge, but so fun! There are tons of gift ideas for everyone on your list… I’m hoping I made the right choice! This Secret Santa has a twist…. Santa Tags! Jcpenney recently came out with this cool feature that allows you to record a personalized gift message for each of your gifts, giving your friends and family a little extra fun this holiday season. It’s especially meaningful if you’re sending a gift to someone far away, as it makes it seem like you’re sending a little bit of yourself with it. Recording my Santa Tag was incredibly easy. I peeled off the front of it to reveal a QR code that I could scan with my phone. (If your cell doesn’t have these capabilities, don’t fret! Another option is to dial a phone number.) You get a call back, and are prompted to record your message. I had about a minute to talk, which was more than enough time to reveal who I am, my blog’s name, why I chose the gift, and to wish the recipient a merry Christmas. You can listen to your recording and accept it, or re-record it if it’s not quite right. 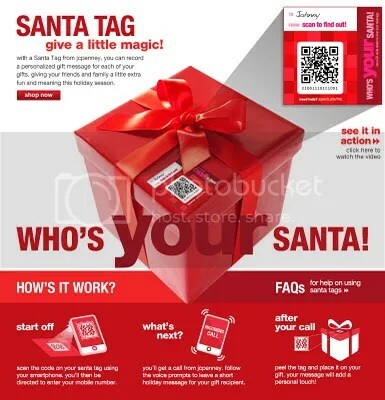 You then peel off the backing and stick the Santa Tag to your gift! The recipient scans the code with their phone to listen to the message. How do you get one of these fancy schmancy Santa Tags, you ask? Any jcpenney customer who purchases a gift in store can receive a tag, while supplies last. If you bought something online, just take it into the store with your receipt to get your tag. If you want more details, this video shows you how the Santa Tags work. I’m looking forward to seeing who and what I got. I’ll let you know next Friday in another post! Disclosure: I wrote this review while participating in a campaign by Mom Central Consulting on behalf of jcpenney and received a jcpenney Secret Santa gift and a promotional item to thank me for participating. Follow the fun on Twitter at #jcpSecretSanta! THANK YOU SO MUCH! The gift was absolutely perfect and I LOVE it, just my style and the color was to die for. Toni @ A Daily Dose´s last blog post ..Raul Rendon’s “A Christmas Fantasy” Jazzes Christmas Up!